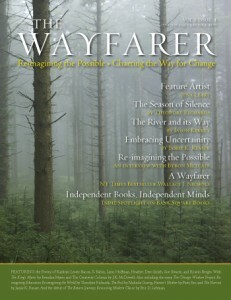 The Wayfarer Winter Edition is Now Available! 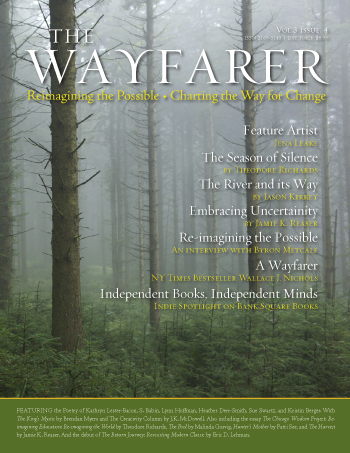 The winter edition of The Wayfarer is now available! Featuring the Poetry of Kathryn Lester-Bacon, S. Babin, Lynn Hoffman, Heather Derr-Smith, Sue Swartz, and Kristin Berger. With The King’s Mystic a short story by Brendan Myers. Also including the essay The Chicago Wisdom Project: Re-imagining Education; Re-imagining the World by Theodore Richards, The Fool by Malinda Gosvig, Hunter’s Mother by Patti See, and The Harvest by Jamie K. Reaser. And the debut of The Return Journey: Book Reviews by Eric D. Lehman. We offer approximately 60% of each issue free to the public on our website. If you find yourself inspired by what you read here and would like to enjoy a full issue, you can order the journal in print or e-edition exclusively in our store.